A Making Change special with six Asian American actors at the Oregon Shakespeare Festival currently performing in The White Snake, an original adaption of a beloved Chinese legend. Dmae Roberts offers this backstage insight into the progress OSF has made in bringing more communties of color onto their stages. We’ll hear the thoughts of Amy Kim Waschke (White Snake), Tanya McBride (Green Snake) and ensemble cast members Cristofer Jean, Lisa Tejero, Ako, and Vin Kridakorn. They talked about what it was like to work on this original show as well as the challenges of being a working actor and finding good roles. Hear about the struggle for ‘representAsian’ on professional stages and the current decline of roles for Asian actors on Broadway. 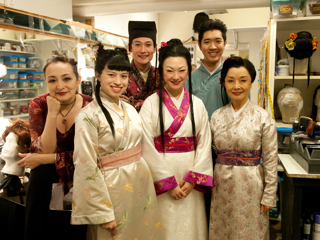 A recent report, Ethnic Representation on New York Stages: 2006/07 to 2010/11 Seasons,led to a series of roundtables with Asian American actors and NY theatres. While the report states the percentage of Asian Americans on Broadway was 2% in 2011, OSF has hit an historic milestone in the 2012 season. According to OSF, 16% of the acting company are East Asian, Southeast, South and West Asian. Don’t miss this look behind the scenes of The White Snake and hear how OSF has been a leader of cultural change in theatre through non-traditional casting. ‘Making Change’ is a series of specials and features on the intersection of creativity and social change. It’s made possible by the Regional Arts and Culture Council and individual donors. 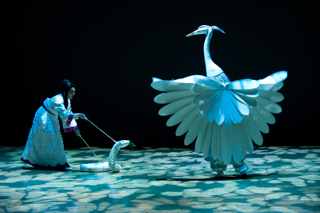 More about the play: The White Snake at OSF is emotionally and visually stunning with fine acting and wondrous projections and lighting effects. The tight-knit skilled ensemble of actors, deftly move through technically challenging scene changes. The stunning beauty of the production and the play’s ultimate message of love leaves the audience breathless while at same time rising for a standing ovation. Created through collaborative rehearsals led by award-winning adapter/director Mary Zimmerman, and with a mostly Asian American cast, this production honors a story even multigenerational Asian Americans might not know. 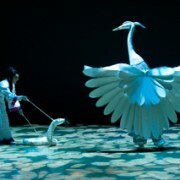 Many versions of the legend of The White Snake have been told and retold through several centuries including books, Chinese operas, even an American opera, as well as countless films and television shows. 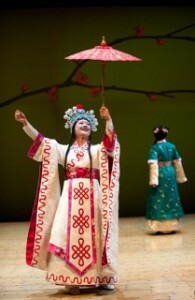 In OSF’s version, White Snake (played by Amy Kim Waschke) travels down from her a mountain and befriends another spirit named Green Snake (played by Tanya McBride). They both decide to take human form to learn more about what it means to be human. They meet a young pharmacist’s assistant, Xu Xian (played by Christopher Livingston). White Snake falls in love and decides to stay in human form so she can wed Xu Xian. She then sets up a pharmacy business that becomes quite successful. So much so that a jealous monk, Fa Hai, (played by Jack Willis) decides to split up the couple. After all, it’s unnatural for a spirit and human to marry. Death, resurrection and a tremendous water battle ensue and play out beautifully onstage. The world premiere of The White Snake adapted from the Chinese legend by Mary Zimmerman runs through July 8 at the Oregon Shakespeare Festival in Ashland, Oregon. Also running in the Spring are the uproariously funny Animal Crackers, a gritty pre-Alamo Western version of Romeo & Juliet and a new adaption of The Seagull. To see a schedule of shows, visit OSFAshland.org.